The Establishing Shot: The Establishing Shot: This years must have gifts and Merry Christmas! The Establishing Shot: This years must have gifts and Merry Christmas! I just wanted to wish everyone happy holidays / Christmas / Hanukkah / Festivus and thought I would dig out my list of this year’s must have Christmas gifts at the same time. Originally this list of much coveted items was put together for the fine chaps over at Liveforfilms.com, but as they are less lifestyle and more film orientated some of the pieces didn’t make the final list. So with only 6 days left till Christmas I thought I would update my list and get it up on the theestablishingshot. If you have any thoughts about other must have items or feedback on any of the items please do leave a comment below. As a budget conscious early adopter I Initially I thought (a meme that I have maintained for over a decade) that celluloid was no longer a necessity and with some know how and perseverance you could use a digital kit to create the same feel as celluloid film. See: Gareth Edwards Factory Farmed. I hasten to add that I never thought that big players would abandon celluloid and go the digital route I always saw it as more of a playground populated by filmmakers looking to break into film and move up to celluloid. Sadly this has not been the case as more and more major players downgrade and yes, the results show in their work. Michael Mann I’m talking to you. Naturally the factors like ” it’s not all technique but content is the crux” come into play but ultimately as an audience I think we are losing something by the increased shift to digital. Combined with the fact that the very reason digital was so appealing = lower cost, the reality is to get a certain look and feel costs just as much if not more as a celluloid set up. So although I’m digitally geared, celluloid is becoming more and more appealing to me. And with the price drop in old 16 mm equipment and with deals like this from Complete 16 it is becoming more achievable. When it comes to gadgets usually only Bond and Bruce Wayne beat me. 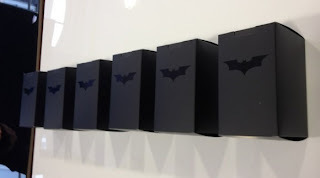 So you can imagine my surprise when I only came to hear about The Dark Knight Rises Nokia Lumia 800 in the last couple of weeks - when some sociable types caused a bit of a buzz online by mentioning they had received these babies. Created out of a partnership between Warner Bros. and Nokia to commemorate The Dark Knight Rises the final film in Christopher Nolan’s Dark Knight trilogy. There are only 40 of these special edition phones in existence. Making them very rare and hard to come by as well as an instant Batman collectible. I would have hard time choosing between keeping it in its box in a display case or actually using it daily. Which would be a bit of a shame as on top of the state of the art intuitive Nokia functionality Nokia have loaded it up with lots of Batman specific goodies such as the subtle black on black batman symbol on the back make it instantly recognisable as one of the special edition Warner Bros Nokia The Dark Knight Rises Nokia Lumia 800s - making it not only a highly sought after money cannot buy gift but a piece of memorabilia that would shine in any fans collection. A little more esoteric and a bit of a guilty pleasure I guess the non divers equivalent would be a Light Sabre or a Hover board. Very cool, but not completely necessary. But ultimately the standard in the future (hopefully). Both Oceanic and AERIS make Heads Up Display scuba masks so you can see all the vital information you need digitally display within your dive mask, a bit like Master Chiefs helmet. So you can access vital information without having to check your equipment like; how deep you are, how much air do you have left and how long have you been down for as well as other less important information that is good to know. I’m South African and grew up with Nando’s Lemon & Herb chicken burger being my fast food of choice. So when I came over the UK it was with some pride I noticed that Nando’s is one of the few South African brands to make its way to the UK successfully and made a place for itself in the UK, very quickly made it my choice for fast food over here too. But with some disappointment that I noticed the difference in quality of the chickens. Having just disqualified myself from ever getting a Nando’s Black Card I’m not going to make the hole any deeper by digressing into the high quality of South African foods. But Nando’s is one of my must do stops when back in South Africa and I highly recommend it. I must confess that I had not heard of the Nando’s Black Card until a certain News Editor from a certain Film Magazine mentioned it. But now I can’t believe I have ever lived without it. A pair of goggles that allows you to watch things. Yup! Sounds about right for the future I was expecting. There are a couple of these units out in the market place but the Sony unit seems to be leading the away in quality and versatility with its high definition, 3D and virtual 5.1 surround system option. To make this gift item ideal it would need a matching mobile unit or convertor to connect to existing units on the move. Imagine you are miles from the shore and discover that the coffee option you have is sub par instant coffee. Sure you could ask the chef to rustle about a decent cup of Joe, but if like me you drink buckets of the rich, smooth kick-starter a portable unit is the way go. And it looks like the AeroPress Coffee Maker is the ideal option. If like me you drink an inordinate amount of wine and occasionally buy in bulk, every now and then you are going to come across a case that really needs more time. Well the boffs over at Peugeot have come up with a great piece of kit. The Peugeot Clef du Vin Wine Aging Key. Like something from Merlin’s bag of tricks - pop it into a glass of wine and every second ages the wine a year. Of course it’s not magic and bad wine won’t become good wind but a fairly decent wine opened before it’s time will fulfil it’s potential. 8. Taschen’s The Stanley Kubrick Archives - Alison Castle, Jan Harlan, Christiane Kubrick, and the Stanley Kubrick Estate. Taschen may have just released the The Pedro Almodóvar Archives but I first come to my attention at the VW See Film Differently screening of A Clockwork Orange at the Brunel University. I was a little awe struck by how visually stunning it was a quick flick through later I knew it was a befitting tribute to the genius of a master filmmaker and already had a space on my bookshelf. The Stanley Kubrick Archives explore Kubrick’s body of work analysing his films and his creative process. Unfortunately the version I need with the twelve-frame film strip from a 70mm print of 2001: A Space Odyssey owned by Stanley Kubrick has been sold out but the regular version is still available from Taschen. Mobile phones/devices are now more ubiquitous than ever before and although industry people will bleat on about UI and interaction etc. There is really very little to distinguish them from each other. Apart of course from my old O2 HTC engineered XDA which was a remarkable leap forward in phones. That is until the Vertu range. Vertu an independent UK off shoot of Nokia. Vertu understands that despite it’s look and status a phone is a phone is a phone and the next step up is what that phone provides past communication. Well apart from the technology based services like the ability to back up all your data (contacts, photos, videos, notes, etc. ), a 2 year service ensuring that your phone stays in pristine condition, 24/7 support and an increasingly more important SECURE content sync and storage and allowing you access from multiple devices and platforms but the real difference with Vertu is the concierge service. A 24/7 service rivalling that of American Express’ Centurion Card but it’s free so you can literally get into anywhere at anytime - within reason of course. So it’s like a phone but more like a magic wand, a magic wand that comes with an equivalent price. His personal life and use of violence in film overshadowing his body of work Samuel Peckinpah was one of the last few American filmmakers that was influenced by the rural life of the Wild West, the great depression and the Vietnam War giving his films a particular hard realism and was credited updating the Western genre. And makes it a must read for anyone looking to either understand film or make it. We’ve all seen them in Duty free. But after test driving one these little beauties. I can safely say the Seadoo makes any dive last longer as you buzz around relatively soundlessly exploring the underwater. I first heard about Robert Sellers’ Hellraisers: The Life and Inebriated Times of Burton, Harris, O'Toole and Reed at Empire’s Big Screen and instantly fell in love with it. A look at the after hours lives of the last great British Hellraisers (apart from the now reformed Colin Farrell). I’m pretty sure that there must have been enough material from one of the titular Hellraisers to make an entire book but I’m sure the quadruple threat of Richard Burton, Richard Harris, Peter O'Toole and Oliver Reed’s late night activities will shock and entertain in equal measure. Bruce Robinson may be best known for his contemporary classic Withnail and I. his semi biographical tale that transcends the whims and trends of filmmaking to astound over two decades after its release. But Robinson has been in the business for a while from stunning with his Killing Fields screenplay to directing Johnny Depp in The Rum Diary. Smoking in Bed: Conversations with Bruce Robinson is a look at a talented writer and his journey trough modern filmmaking. William Friedkin another old school American film-maker not treated with nearly the respect that his talent deserves. With an output that covers the spectrum from metaphorical Comedy (Deal of the Century) to Horror (The Exorcist) through every thing in-between including the tense action drama of Sorcerer, The French Connection and one of my top film of all time To Live and Die in L.A.
William Friedkin: Films of Aberration, Obsession and Reality in an in-depth study of Friedkin’s films and his growth as a filmmaker. As I get older and more immersed in spending more time filming and taking photographs underwater I need all the help I can get to make my oxygen last longer. The Darkfin Gloves promise to turn the wearer into The Man From Atlantis not only by giving them webbed fingers but also increase your swimming speed with the same effort. Something a little more domestic. With modern households becoming more and more full of hi tech gadgets and the cabling that comes along with them. The Bluelounge CableBox is a storage solution that keeps cables and power supplies well hidden and looking smart at the same time. We may not get hover-boards anytime soon but the Blade Runner inspired neon umbrellas have been available for a while now. I’ve known about them for awhile but still haven’t been motivated enough to replace my sturdy Timberland umbrella and American Psycho rain coat combination. Since my HP Printer/ Scanner/Fax packed it in I’ve had an eye out on a decent replacement when I came across the DocuScan. You can scan photos, documents or hand written notes with up to 300 DPI quality. It also has a small screen so you can check the scan. My first choice would be the Sony VPL-VW 1000 ES 4K projector which gets its public debut this month but sadly it is out of my price range and is also not a 3D projector so I’m going to have to go with the Sony VPL-HW30ES 3D Projector. Update: I have now demo’s the Sony VW 1000 ES 4K Projector and it a serious piece of kit. And my earlier assumption regarding it’s 3D functionality is incorrect and it is 3D capable. I should have a write up online soon. Another one from Taschen possibly the ultimate tribute to a film, Steve Schapiro is a photographer that has worked on more than 200 motion pictures including Martin Scorsese’s Taxi Driver and took 1000s of photos during the shoot and behind the scenes. Some of these frankly outstanding photos have been collated and captioned in a single volume - Steve Schapiro, Taxi Driver creating a time capsule of Scorsese’s seminal work. Perfect for after dinner libations whilst watching the Hudson Brothers creepy Victorian period thriller From Hell. The Art nouveau lady absinthe fountain can serve up to four drinks at one time, with the option to slow the poring speed to match your drinking pleasure. It also makes a good pseudo sculpture. BFI membership not only allows you to support an important national institution but depending on your subscription level you get to hear about what is happening at the BFI ahead of the public including; film talks, special screenings and priority booking which includes The London Film Festival as well as loads of special members offers like free screenings, access the BFI library, DVDs and discounts. If there is one film membership you should have it should really be the BFI. I love film art particularly when it re-imagines iconic visuals or passionately reinterprets the films I love. So when I heard about Gallery 1988’s Crazy 4 Cult projects I was keen to see what it was all about. And when a copy of Crazy 4 Cult: Cult Movie Art was fortuitously dropped off with our concierge I was ecstatic. The 174 page A4 hardcover book pleases from the cover showing a clearly pissed off Jules Winnfield (Samuel L. Jackson) from Pulp Fiction about to unload a clip. As beautiful as the cover is I couldn’t wait to get inside Crazy 4 Cult: Cult Movie Art. It is glorious as artists tackle film favourites, mash ups, genre bending and new and mixed media representations of old classics. There is a wide variety of art techniques covering many, many films. Some of the art was exactly my thing and I could easily picture it on my wall like Chris Sanchez’s Come out and Play print, from The Warriors, whilst some wasn't my bag. But guaranteed that there will be more than some pieces you absolutely love. Crazy 4 Cult: Cult Movie Art is beautiful and I’m a little hesitant to describe it as a coffee table book as I’m not leaving lying around for just anyone to flick through. Crazy 4 Cult: Cult Movie Art This lavishly produced book presents the best of the first 4 years of the Gallery 1988 art show, with art inspired by such movies as The Big Lebowski, Edward Scissorhands, Blade Runner, Donnie Darko, Clockwork Orange, Pulp Fiction and many more. When Film: A Critical Introduction arrived I was excited as it’s a book that deconstructs cinema via intelligent conversation. Something that is in unfortunate decline - with the rise of front room conversation critics and a shift from technique to celebrity culture. Don’t be put off by the fact that the words student text book may appear in descriptions of the Film: A Critical Introduction, 3rd edition. Although I’ve only managed to scan it - It is a 468 page, eye pleasing, easy to digest reference book packed with photos and intelligent discussion on appreciating film and critical analysis. It transcends it entry level status and is invaluable for anyone that has: - an interest in film - wants to understand film with a richer appreciation – as well as those wishing to or already studying film. As this is the third edition and not only an in-depth exploration of film as a concept in context referencing 100s of films, filmmakers and techniques, terminology, film production, critical thinking and writing - it also covers topical conversations such as; Avatar, Genre hybridity, Inglourious Basterds, Intertexuality, Knocked Up, Bromance Ideology, Mumblecore, Digital Technologies & 3D.. Organized in three parts, the text focuses on the fundamentals of film analysis before moving on to more complex topics. Readers will learn to form sophisticated arguments about film in cultural, historical and economic contexts. If like me you are mildly obsessed with film and are interested in locations used during the making of films a guide to these locations is a handy resource indeed. The new edition of the London Movie Guide focuses on walks and tours. So if you are interested in visiting any of London's many memorable film locations, around 950 are covered in London Movie Guide: Walks, Tours and Locations. A delight for both film buffs and London enthusiasts, this practical guide is organized area-by-area – from the heart of the city to the suburbs – so the reader can explore locations close to where they live, work and play. Incorporating annotated maps of film hotspots around town, it is now easier than ever to walk, tour and relive your favourite movie moments in London. The Establishing Shot: This year’s must have gifts and Merry Christmas!